RoyalEnfields.com: Royal Enfield Classic in short supply? Royal Enfield Classic in short supply? The dramatically new, yet retro-styled Royal Enfield Bullet Classic 500 isn't even in the United States yet, but many of them may already be gone. Referred to as the C-5 model, these motorcycles got a positive review in Cycle World's March edition. The magazine's writer and photographer travelled to India to sample C-5s right off the production line in Chennai. They cited the unit-constructed engine, fuel injection and maintenance-free hydraulic lifters before concluding that, while everything has changed, much has remained the same. "All the creativity is built into the machine. 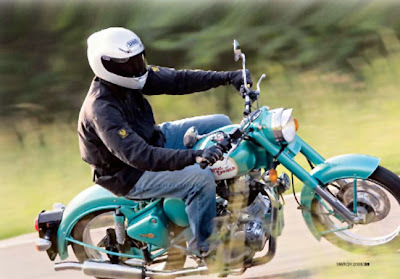 The only idea that wasn't new to Royal Enfield was that the virtues and pleasure of riding a (formerly) British Single should carry on," Cycle World wrote. The C-5 is designed to resemble a Royal Enfield of 1951. That makes it even older in appearance than the 1955-era Royal Enfield Bullet built virtually unchanged in India all these years. But its appearance disguises a more sophisticated frame (painted to match the body work) and swing arm, improved clutch and front disk brake. Unlike Royal Enfields of previous decades, the UCE models are designed to cruise at 70 mph with a little extra in hand for passing. They remain 500cc machines with long-stroke single "thumper" engines. You won't be going too fast to smell the roses. But will you be able to buy one when they eventually get here later this year? "Nothing has changed about the delivery time of the C-5s," according to Kevin Mahoney, of Classic Motorworks, the U.S. importer. "The one thing I will say is that the first container and most of the second is spoken for by dealers already. If guys want one they better get to their dealer now." The suggested price for a new C-5 in the U.S. is $6,395, making it Royal Enfield's most expensive model here. That price doesn't include set-up, shipping or tax. The Bullet Classic is still unavailable in Germany. But first two containers already sold prior to delivery according to German importer. First container is expected end of April 2009. Originally advertised for sale end of February. My guessing.......first C5 sale in the US two months later than expected. Does Indias calender differ from ours? Their meaning of time surely does! Thank you for your interesting comment. It makes me wonder if any automotive product ever hits its target release date. My reading of history suggests that most fall behind. People always fasten on the "best case scenario" for delivery, usually too optimistic. The difference for motorcycles is that they must not miss the spring selling season. However, if you want a product as specialized as a Royal Enfield, perhaps you will NOT go out and buy a different motorcycle but will just wait until you can get what you want. Very true mate this is one of the Best Rides around !! Well $6,395 for a Classic.. and that too excluding set up, shipping and Tax... Seems a little pricy to me... The costs in India for a classic is $3000-$3250 including insurance and Taxes.. I wonder why you need to pay double the rate in the US. Maybe it may work out cheaper of you buy it in India and have it Imported on your own.